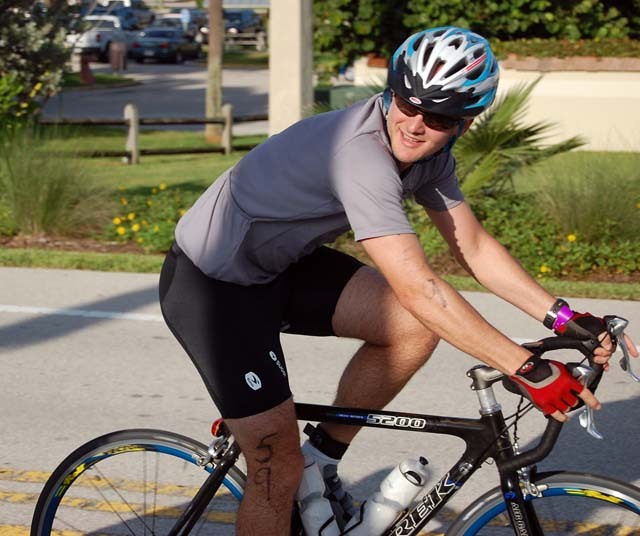 Youngest son Adam and his co-worker, Scott Maulsby, have been talking up entering the Loggerhead Triathlon – 3/8-mile swim / 13-mile bike / 3.1-mile run – for weeks. Adam had been a runner for some time and had lived in our pool when he was a little kid. He started biking several months ago and stepped up to a better bike just recently. His family, particularly his older brother, didn’t rate his chances all that high. We figured he could bike OK; he could run OK; he could swim sort of OK, we just weren’t sure he could do them all at once. Swimming was the first leg. He thought it would take him 45 minutes to do the 3/8 mile. (We don’t know if that counted the time to recover the body.) In fact, he finished the swim portion in 11 minutes and 10 seconds. His mother and I opted to skip the swimming part and catch him during the biking phase. Because he was way ahead of schedule, he was on his second turnaround when he and Scott buzzed by us. We had enough time to drive up to where the running portion was making the turn off A1A onto the road leading to Dubois Park. We hit a police roadblock where a very friendly policeman told us we could pull our car into a parking lot right across from the watering station. It couldn’t have been any more convenient. Right on schedule, Scott and Adam passed by looking only a little worse for the wear. Here is where you can find all the results. For more pictures, navigate here. They are mostly unedited. This is the guy who really deserves recognition. 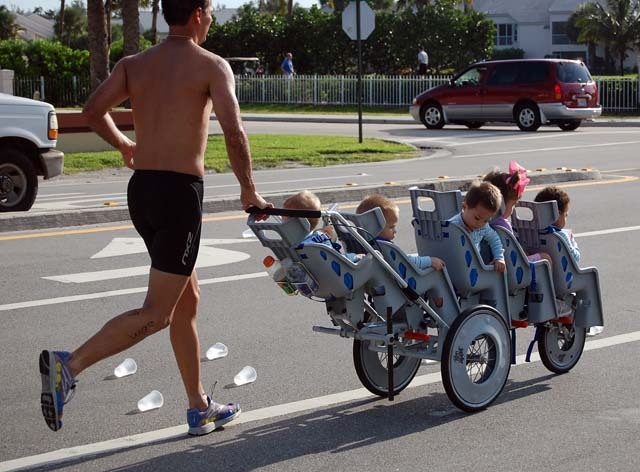 He’s got on a race number, but I don’t know if he pushed the kids the whole way. I’d loved to have seen him on the biking and swimming legs. It seems that the guy who needs recognition not only needs it for being a good dad by including his FOUR kids into his race, but actually for completing the race FIRST in his division. AND THEN turning around and doing it again with his kids. A detailed look at the two pictures on your website shows that his age is “39” and his number was “603”. Cross referencing this on the final results page shows that he completed the race in just over an hour. Additionally, I remember seeing him on my way back from the turn around on the run. His age group would have been done WAY before mine, so he had actually completed the race already, picked up the kids and turned around to do it again. Not only that, but his pace looked faster than mine the second time around. Kudos David Reback from North Palm Beach. I’ll see you at the next one. I looked up what I thought was his number and saw those stats, but couldn’t believe they could be right. I was confused by what looked like a 9 on the back of his calf, but 603 on the saide. I didn’t realize they put your age there, also. What he did WAS impressive. Oh, and, by the way. He had FIVE kids in that stroller, not the four that you counted. Clarification from the elder brother: I knew he’d finish the Loggerhead Triathlon. I even had money placed that he’d be in the upper two-thirds of the field. With his finish in 399th place (out of 600 entries), he made me five bucks but only by one position. Next time, Adam, how about giving me some breathing room? Overall, Adam did great. 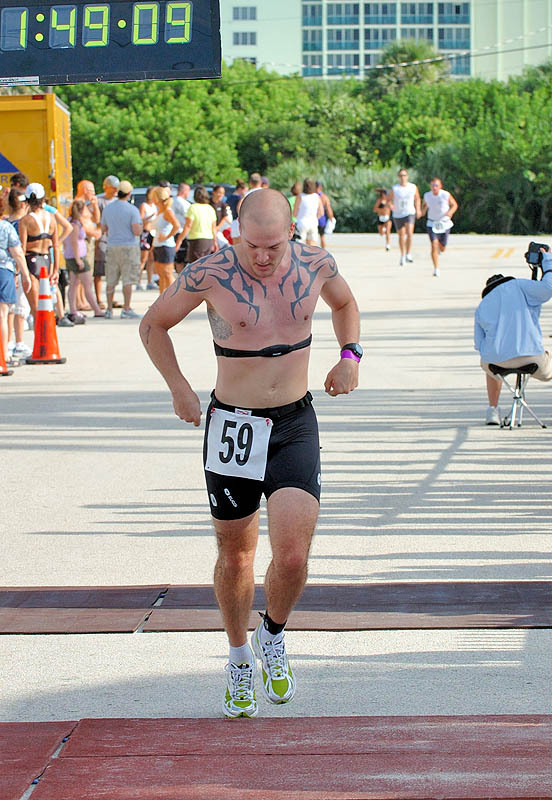 On the other hand, it’s the half-Ironman in Miami I’m worried about on his behalf. The Loggerhead was 16.475 miles — Sprint length. The half-Ironman is 70.3 miles. That’s more than four times longer. I saw the pain in his face as he crossed the line after the short event. Adam: do you feel you will need to adjust your training schedule for the half-Ironman or do you see yourself as still being on the right track? Training can kill you. During WWII, I read that it was decided that parachute training was just as likely to kill you as jumping into combat. In cases where they only expected you to make one jump, they’d do ground training and make your do your first one with bullets whizzing around. Maybe he’s afraid he’s only got one half-Ironman in him this season. There’s only so much wax in the candle. I have no worries for the half-Ironman in November. As I’ve said before – I can do ANYTHING that I put my mind to. Even if I am not fully prepared, I will find a way to make my mind/body do what is necessary to complete the challenge. I’d like to post a comment on the picture above that shows a time of 1:49:09. My time was actually 1:29:09, because my heat started 20 minutes after the start of the race.